Whenever it’s time to go back to school my moms start thinking about school lunches again. It’s super important to make sure you are eating healthy at lunchtime. I can’t speak for all schools, but I know in my public school we can’t rely on the cafeteria team to provide us a clean and well balanced meal, especially when they consider French fries a vegetable. 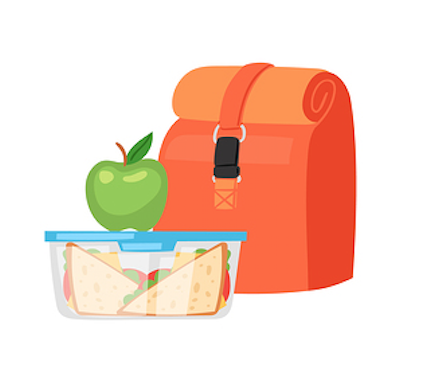 Those parents who don’t want their kids participating in school lunches provide a packed lunch every day. Year after year, I am amazed at what most kids have in their lunchboxes — things like ice cream bars, candy, sticks of processed meat and cheese, rolled fruit sticks and overly processed chips, to name a few. It’s no wonder why so many kids are bouncing off the walls after lunch and have a hard time concentrating in school. I know it’s hard taking time in the morning to make a healthy lunch and I know how easy it is just to buy prepackaged items to throw together each day. But I want to challenge you to read the labels of the food you are throwing together in your lunch each day. Notice how those items are loaded with chemicals and preservatives and very little nutrition. My moms make my two sisters and I a fresh homemade lunch every morning and it takes us 20 minutes. I am going to share with you some tips that we use for putting together these super healthy lunches that we love with the hopes that you will consider doing the same for your kids’ lunches. As far as a healthy chip, we like to use Organic Non-GMO blue and yellow corn chips, Spelt pretzels, super clean potato chips with only 3 ingredients, and veggie chips (you know, the ones made out of sweet potatoes and turnips). Fresh fruit is easy to add to your lunch; having it around and pre-cleaned is very helpful. We usually go shopping once a week and buy everything we need for the upcoming week, no more and no less. Examples of fresh fruit we like to use include strawberries, apples, oranges, bananas, mangoes and grapes. Fresh vegetables also are super important for us and are easy to prepare ahead of time or the morning of. Fresh veggies we like to use include sliced English cucumbers, celery, carrots, small sweet peppers, and grape tomatoes. Many of these go well with hummus and some type of nut butter, so you can include a small amount of that as a dip. Another veggie we like to include in our lunch is cucumber, tomato, and garbanzo bean salad. Whenever we make it for dinner we make a little extra to have for our lunch the next day. Also, if we have activities after school, my mom usually adds some type of trail mix to our lunch that we can eat after school as a snack. Raw almonds with cranberries is our favorite. The key with all of this is that no matter how many kids are in your family, try as much as possible to make the same items for each so it cuts down on your prep time. Making three customized lunches for three different kids is tough. Finding a menu throughout the week for each day that everyone can agree on is very helpful and will make the morning go much smoother. I hope this helped in your quest for healthier lunches while at school. Here’s to a great school year for all — good luck! By Kai Nunziato-Cruz, a 12-year-old nutrition expert from Arizona. As the son of Liz Cruz M.D., a board-certified gastroenterologist, and Tina Nunziato, a Certified Holistic Nutrition Consultant, Kai has watched his moms for years help adults get well and stay well with their books, podcast, online home study program and more, and felt it was his mission to take those same teachings to kids. Kai is the author of Digest This Now! for Kids a kid-friendly, doctor-approved book about healthy eating. He also teaches through his YouTube show Generation Kai. Previous article High School Extracurriculars: What Matters in the College Application Process?